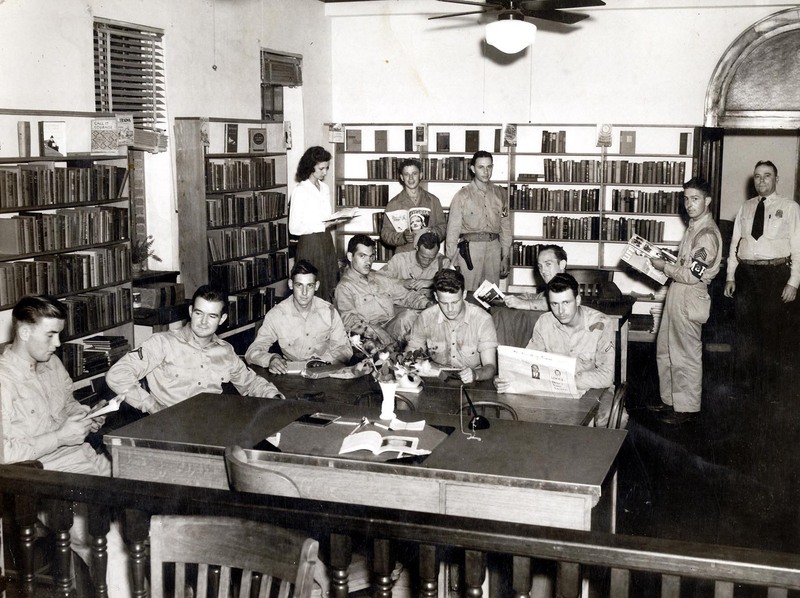 Soldiers in Bossier City Library 1941. A photo found in the collection of photos which were in the Library’s collection before a distinct, documented History Center collection was started in 1997 has multiple mysteries. The photo has penciled on the back the names of some of the soldiers but no key to which soldier is which: John Kutni; Westle Beck; Anton Johnson: Edward Engledow; Al Ostrom; Baumgarten (no first name listed). So one mystery: who is who? The librarian is identified as Ms. Irma Rayne. In addition to the original photograph, a newspaper clipping that ran this photo with the caption above was in the library’s file. Someone typed on the top of the clipping that it was from the October 2, 1941 Bossier Tribune. A reprint of the photo in the Shreveport Times for the library’s 25th anniversary says the maneuvers are the “state maneuvers prior to WWII” – undoubtedly referring to the famed “Louisiana Maneuvers” (see Ms. Pam’s History Lesson). Unfortunately in the History Center’s collection we don’t have any record of the maneuvers in Bossier besides the photo identified in our collection as “Maneuvers at Benton, 1941” shown in the “History Lesson” at right. We do know that Barksdale hosted maneuvers and that the final battle of the 1941 Louisiana Maneuvers was the “Battle of Shreveport.” So where exactly were these soldiers arriving from night after night? Were they camped somewhere in the woods of Bossier Parish? Were locals sneaking them fresh water or selling them homemade bread as documented in the Alexandria area? 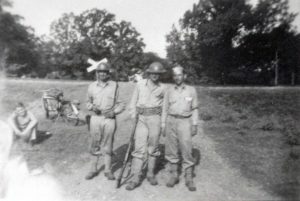 The 1941 Louisiana Maneuvers were the largest training exercises ever in US Army history – before and since– and were held with half a million men in a 30,000 square mile area in northwest and central Louisiana. “The Second Army” commanded by General Ben Lear was pitted against the “Third Army” commanded by Lieu. General Walter Krueger fought for control of navigation rights to the Mississippi River. There were even real casualties—61 men total killed in accidents. They tested new types of equipment, strategy, supply systems and the use of massive divisions and corps instead of customarily small units. The maneuvers also brought public attention and money to the area and resulted in the establishment of new training camps like Fort Polk and Camps Claiborne and Beauregard. The 1941 maneuvers ended with the “Battle of Shreveport” in September, 1941 then moved to the Carolinas, wrapping up only 9 days before Japan attacked Pearl Harbor Dec 7, 1941 and the U.S. entered the war the following day.